Major League Baseball announced its MVPs for the 2017 season on Thursday night. One race was almost too close to call while the other turned into a surprising runaway. In the National League, Marlins outfielder Giancarlo Stanton won MVP, barely edging out Joey Votto of the Reds by a mere two points. In the American League, Astros second baseman Jose Altuve followed up his team’s world championship by winning MVP by a wide margin. Stanton put on an absolute show over the course of the season. He took his impressive power to another level by smashing 59 home runs. He also posted an OPS of 1.007 and drove in 132 runs. Despite his team’s lack of success in the win column, it’s hard to argue against Stanton being the best player in the National League this year. “I’m so thankful it happened and I’m going to enjoy this and work to get better,” Stanton said after learning he was the MVP. Of course, voters nearly gave the award to Votto, who came excruciatingly close to winning MVP for the second time. Both Stanton and Votto received 10 first-place votes. However, Stanton received one more second-place vote and one more third-place vote than Votto. That was enough to give him the award. Paul Goldschmidt of the Diamondbacks earned four first-place votes to finish third in the voting. Rockies teammates Nolan Arenado and Charlie Blackmon received first-place votes as well and rounded out the top-5 in the National League. Voting in the American League was a little more cut and dry. What was expected to be a close race between Altuve and Yankees outfielder Aaron Judge was not so close. Altuve received 27 of the 30 first-place votes, while Judge, who won Rookie of the Year earlier this week, only earned two first-place votes. Jose Ramirez of the Indians received the final first-place vote. Judge beat out Ramirez for second place with Mike Trout and Francisco Lindor rounding out the top-5. “Winning the MVP has made me want to keep getting better and keep helping my team for the next whatever years,” Altuve said after learning he won MVP. Before his impressive postseason performance, Altuve took home his second straight batting title, and third overall, after hitting .346 during the regular season. He was the catalyst for baseball’s most powerful lineup in 2017. Winning MVP was a long time coming for the diminutive but talented second baseman. 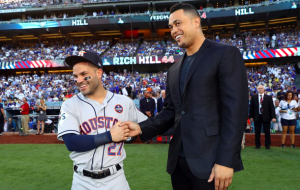 After winning MVP, Stanton and Altuve appear to be on completely different paths. Altuve is poised to return to the Astros in 2018 and help Houston repeat as World Series champions. Meanwhile, Stanton has already become the most talked about player early in the hot stove season. The Marlins trading Stanton is almost inevitable at this point. In fact, it’s impossible to rule out Altuve and Stanton competing against one another for American League MVP in 2018 and beyond.